Friday, August 2, 6-9 p.m.
1. 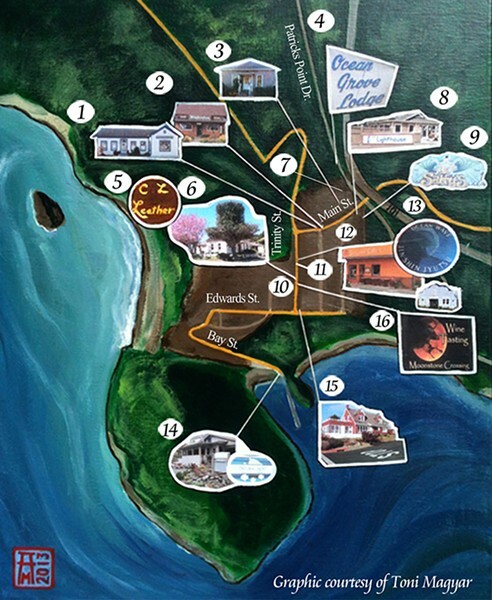 Trinidad Trading Company 460 Main St. Luka Hey, acrylic paintings featuring contemporary Buddhist art and landscapes. Original Songs by Tim Breed. 2. WindanSea 410 Main St. Midori Angelica Designs, jewelry. 3. Trinidad Museum 400 Janis Court "A Contribution to Prayer," photographs of Native Americans of the Northwest by Lee Taylor Walashek and J. Goldsborough. Guitar vocal music by Richard "Ziggy" Eisner. 4. Ocean Grove 480 Patricks Point Drive. Afterparty! Original country rock by Rooster McClintock. Doors open at 9 p.m. Admission $5. 5. CL Leathers 490 Trinity St. Original folk music by Joe Garceau in the Mobile Stage. 6 Trinidad Art Gallery 490 Trinity St. Artist reception for Kris Patzlaff, art jewelry and found object metalwork. Harp music by Howdy Emmerson. 7. Saunder's Park start of Patricks Point Drive. "Spin Jam" at 6:30 p.m. Fire dancing, Circus of the Elements at 8:45 p.m. Trinidad Skatepark Alliance will provide ramps. Bocce ball court. Balls available at the museum and Salty's. 8. The Lighthouse Grill 355 Main St. Susan Mayclin Stephenson, paintings. Pachamama Jewels, jewelry. Music by North. 9. Salty's 322 Main St. Live ocean-theme drawing and painting by visitors. Music by "Double Up." 10. The Eatery 607 Parker St. Gus Clark, acrylic and mixed media. For Folks Sake, performing. 12. Beachcomber Cafe 363 Trinity St. Petra Wilkinson, photography. JD Jeffries, performing. 13. Ocean Wave Healing Arts Studio behind Beachcomber. Free sessions of Jin Shin Jyutsu and ortho-bionomy. Furniture and instruments by Mark "Tree" Allen. 15. Trinidad B&B 560 Edwards St. Sam Lundeen, Trinidad landscapes.